School Programs with Award-winning Author SherMay Loh & Lord Archibald! Epigram Books is proud to present the next installment of the Archibald series by award-winning author, SherMay Loh: Archibald and the Black Knight’s Ring! We believe that SherMay may be familiar to many teachers and schools as she has appeared in schools such as Tao Nan, Henry Park, RGPS and Haig Girls amongst others when she released her first novel. We hope that more schools would like to invite SherMay to their schools this year! A new program that we have in 2012 is the Assembly Talk (Option 1) organized in conjunction with the Budding Writers League and Monsters Under the Bed. For the Assembly Talks, experienced trainers will help your students rediscover the fact that writing can be fun and even teach them how to get published! Our second program is the Fireside Chat (Option 2), a more intimate session where SherMay would host a group of students to talk about her experiences writing and reading, and will encourage your students to do the same. For schools that held the Fireside Chats previously, SherMay has updated her program to incorporate a discussion about her latest novel as well as new practical examples to inspire the kids. 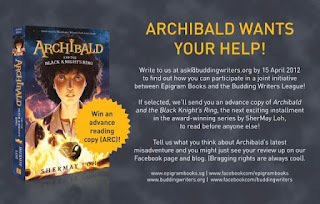 Lastly, Archibald Wants Your Help! If you have students interested in participating in our brand new review initiative, please refer to the banner visual for more information! This initiative is a fantastic way to get your students reading and writing and involve them in the publication of a brand new novel. We look forward to hearing back from you soon. Please do not hesitate to contact us should you need more information on any of the programs or initiative.